Image caption Jeffrey DeLaurentis (left) is seen by many in Cuba as a "friend"
Reserved, thoughtful, dedicated, wise and humorous - the new US charge d'affaires in Havana, Jeffrey DeLaurentis, is all of the above, according to his former boss Vicki Huddleston. 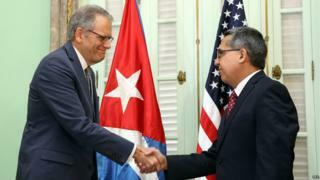 And those will be much-needed assets in the coming months and years if the US and Cuba want to succeed in rebuilding diplomatic relationships, which have been broken for more than 50 years. Jeffrey DeLaurentis was named head of mission in August last year. It is his third stint in Cuba. He first served here as a consular officer between 1991 and 1992. He then returned as head of the political-economic section from 1999 to 2002. "He knows Cuba, he can provide wise guidance to the state department and to the president, because he has a solid relationship with the Cubans," says Ms Huddleston, who was herself head of mission between 1999 and 2002. "They know Jeff respects them and they trust him." Mr DeLaurentis has focused on Latin America for much of his diplomatic career. He worked at the US embassy in Bogota, at the United Nations in Geneva and in Washington where he spent time at the Bureau of Western Hemisphere Affairs and at the National Security Council. It was at the National Security Council that Ted Piccone worked alongside him. He is now a fellow at the Brookings Institution in Washington. "He's got just the right mix of experience that is needed in this case of a very historical special unique moment in US-Cuba relations," says Ted. "Cuba has changed from his last posting so I think it's particularly useful to have someone who saw it previously and has a better context for the changes that have happened since then." It is a view that Cubans share too. "In Cuba we see him as a friend. As someone who hasn't come here to screw up the relationship," says former Cuban diplomat Carlos Alzugaray. "I think Jeff is aware of what's happening in Cuba, he's sensitive to what might make a Cuban mad about US foreign policy. He can really understand us and you feel it." Mr DeLaurentis has navigated difficult times while working in Cuba. He first lived in Havana when the island was facing severe economic difficulties after the Soviet Union's collapse. He also played a part in the story of Elian Gonzalez - the Cuban boy who in 1999 became a world-famous symbol of the bitter dispute between Cuba and the US when he was picked up in the Florida Straits. He was one of three survivors from a group of people who had set off to reach the US in a handmade boat. Taken to Florida, the US courts eventually got involved and ruled that he should be returned to Cuba and be reunited with his father. It was, for Cuba, a huge victory. "We had to keep the Cubans on board with us," recalls Ms Huddleston. "Jeff and I had to talk to Washington and tell them this was a serious moment, we have to handle it quietly and effectively and Jeff is a very effective diplomat." As Jeffrey DeLaurentis forges a new diplomatic future, the building that will house the US embassy is living history of the turbulent relationship between Cuba and the US. Sitting on Havana's Malecon or seafront promenade, it was the US embassy until diplomatic ties were cut in 1961. From 1977, it then became a US Interests Section under the legal protection of the Swiss government. Across from the brown-glass building is what is known as the anti-imperialist stand, built in 2000. It was here Cubans held an anti-American demonstration over the Elian Gonzalez case. On the side are big letters that read "Fatherland or Death" and "Venceremos" - we will triumph, in the words of the Cuban revolution. At the top of the plaza are around 140 flagpoles that obscure the view of the embassy building. That of course was the intention when the US erected an electronic ticker that flashed human rights messages and criticism of the Cuban government. Nobody wants a return to those combative times. And for the US and Cuba to triumph in the next few years, patience is what is needed, says Peter Hakim of the Inter-American Dialogue in Washington. "I think the path now becomes deeper. I think that up until now Congress really didn't have much to do and say in this," says Hakim. "The president wasn't violating or proposing changes to the laws. Now Congress has to be brought front and centre with the embargo and with Guantanamo eventually - they are two big steps." But they are steps even Raul Castro has said will take determination. On both sides.